According to Israeli human rights group, B’Tselem, Israelis killed a total of 107 Palestinians in 2016, 101 of them by soldiers and 6 by settlers. B’Tselem pointed out that 90 of the slain were killed in the occupied West Bank and East Jerusalem. The report also counted eight in the Gaza Strip and three by Israeli forces inside Israel, according to Days of Palestine. It was further pointed out by B’Tselem that ten women and one girl were among the dead. Seventy-four of the Palestinians were killed during incidents in which they allegedly assaulted or attempted to assault Israeli security forces and civilians. 17 were killed during clashes with Israeli forces, equipped with lethal arms, in demonstrations and in stone-throwing incidents. The rest were killed by airstrikes and tank shelling, during arrest missions and in other incidents. 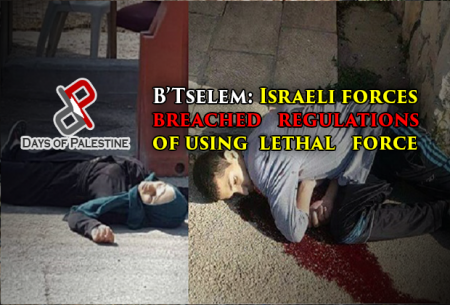 B’Tselem also said that soldiers killed two foreign nationals.